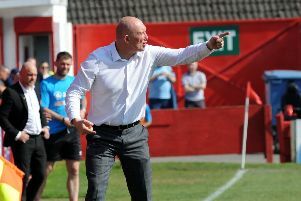 Alfreton Town boss Billy Heath was pleased with his side’s efforts as they extended their unbeaten run to six games with a 1-1 draw at Spennymoor Town on Saturday. Jordan Sinnott’s penalty earned a share of the spoils, the Reds keeping up their record of scoring in every away game they’ve played this season in the process. And Heath continues to be pleased with how things are going. He said: “It was difficult to play on this pitch. They play on it week in, week out and the biggest thing we talked about all week was that we knew what was coming and you have to have the stomach to come here and you have to have the gumption for it, and we had those things. Ahead of the midweek games, none of which involved Alfreton, Heath’s side were seven points off the play-off places and in 13th position. And the Reds boss is refusing to admit defeat in the club’s attempts to break into the top seven before the end of the campaign. “It keeps us in with a chance of the play-offs. It’s slim, but we’ve gone within seven points of the play-off spots. We thought with the eight games before today we could possibly get away with a draw - now we just need to win every game,” Heath chuckled. Next up sees Alfreton travel to play Bradford Park Avenue on Saturday, their hosts firmly in the play-off picture and also on a good run of form. Heath said: “Bradford has always been a tough place to go and they have a really good team, so we know it’s going to be difficult, but we’re full of confidence. “The run goes on and the mental side of the team now is a lot better than it’s ever been. “We’re more resilient and that’s what we’ve got to continue.